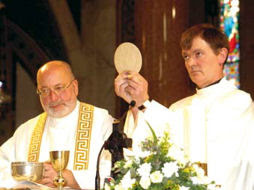 A ‘concelebrated Mass’ on Easter Sunday 2006. Photo courtesy of the Church of Ireland Gazette. Three years ago an Augustinian priest residing in the Armagh archdiocese caused a sensation when he attempted a concelebrated Mass with a clergyman of the Church of Ireland. The question that bugged Melancholicus at the time was not how on earth could a Catholic priest concelebrate holy Mass with an Anglican (nothing surprises him in these heady, post-conciliar days), but how a clergyman of the Church of Ireland could stoop to such popery in the first place. The answer of course is that Rev. Michael Graham is an Anglo-Catholic, which in practical terms means he’s more Catholic than Iggy. Yes, the priest’s name is Iggy, which one presumes is a contraction of Ignatius. Melancholicus does not know whether this is his baptismal name or his name in religion, but the fact that he has chosen so to bastardize it shows clearly the side of the cultural and theological fence whereon he sits. This is the face of ‘religion lite’, and ‘religion cool’, an attempt by this particular henchperson of newchurch to have his version of Catholicism considered relevantTM and meaningfulTM by a public so unchurched by the experience of the last forty years that they haven’t the faintest grasp of the immense differences between Catholicism and Anglicanism. Well, Iggy has been pretty much out of the news since then, and now a golden opportunity has at last presented itself for Iggy to score a few points and let off some steam from the stinging criticism he received for being so ecumenical in 2006; and in so doing, once again to get his name in the papers and his face on the telly (or so he wishes). There’s nothing quite like self-promotion, is there? This time his target is the Holy Father himself, rather than those anonymous souls whom three years ago he castigated for being corrupted with piety. And the occasion? Bishop Williamson’s ‘re-incommunication’, naturally. THE ATTEMPTED rehabilitation by the Vatican of Holocaust-denying bishop Richard Williamson has been described as “the crowning disgrace of Pope Benedict’s career” by controversial Augustinian priest Fr Iggy O’Donovan [McGarry is supposed to be the 'religious affairs correspondent' of this newspaper, which means that Madam invariably turns to his services whenever something of ecclesiastical interest materializes. But in the phrasing of his opening sentence, McGarry shows the same unthinking obtusity characteristic of nearly all secular journalists that covered this story. What in God's name does 'attempted rehabilitation' mean?]. He has also said that change initiated by Vatican II in the Catholic Church [ah, here we get to the real point!] has become “a debacle” [Melancholicus would agree with Iggy there; it is a debacle. But methinks that Iggy probably meant something else]. Announced 50 years ago, Vatican II, “this noble venture” [well, Pope John XXIII's intentions were good, even if the council were thwarted by revolutionaries on its very first day, revolutionaries with whom Iggy is clearly in sympathy], was now “on life support” [life support? Really? There's hope yet for all us 'corrupted with piety' types! Te Deum laudamus...]. “Almost from day one insidious attempts were made to undermine conciliar reform,” he wrote in an Augustinian newsletter [he is speaking primarily of the liturgical 'reform', but Melancholicus surmises that Iggy's opposition to Pope Benedict's restorationism goes much deeper than that]. “If anything illustrates this latter point it is the recent announcement, on the 50th anniversary of the convocation of the council, of the lifting of the excommunication of the bishops illicitly ordained by Archbishop Lefebvre.” [that was a piece of wry humour on the part of the Holy See intended for the benefit of the SSPX. But we see it has enraged the likes of Fr. Iggy, for whom traditionalist Catholics are the ultimate untouchables]. In 2006 Fr O’Donovan was bound to silence and removed from a teaching post in Rome by the Vatican [proper order] after he concelebrated an Easter Sunday Mass in Drogheda with local Church of Ireland rector Rev Michael Graham. “We are now at a juncture where Rome demands total conformity with papal ideas and ideals in all things and not merely in those which are essential to the unity of Christian and Catholic faith,” he said [this is mere petulant lashing out in order to stir up the emotions of the mob. Rome demands no such thing]. “That is all very well but when the Holy Father is ‘accident prone’ (as the present incumbent is) the potential for damage to the church is incalculable. “The recent case of the rehabilitation of ... Richard Williamson is a prime example of this.” [Like McGarry, Iggy also likes the word 'rehabilitation' even though it has absolutely no meaning in the context in which he uses it]. President Barack Obama had “been quick to come out and admit he ‘screwed up’” in proposing Tom Daschle as health secretary. “In the case of Williamson Pope Benedict certainly ‘screwed up’ and must be as forthcoming as Obama in admitting it,” he said [this comparison is not apt. Daschle was proposed as a cabinet appointment. Williamson has merely had his excommunication lifted, not because of his views but in spite of them. He has been appointed to nothing, and Iggy knows it]. He continued: “how a German-born Pope (and a former member of the Hitler Youth to boot) could not foresee the furore that would follow the rehabilitation of a man who denies the Holocaust leaves me baffled. It is the crowning disgrace of Pope Benedict’s career.” [this as good as calls the Holy Father a Nazi. The Hitler Youth reference is a cheap slur; it is widely known, even among secular journalists, that the young Joseph Ratzinger's membership of the Hitler Youth was not voluntary, nor did he or his family support the regime]. Reuters adds: Pope Benedict said yesterday that “any denial or minimisation of this terrible crime is intolerable, especially if it came from a clergyman [McGarry has at least included this clarification, which goes a long way to placing Iggy's self-seeking hysteria in context]. The pope also confirmed that he was planning to visit Israel. Vatican sources say the trip is expected to take place in May.